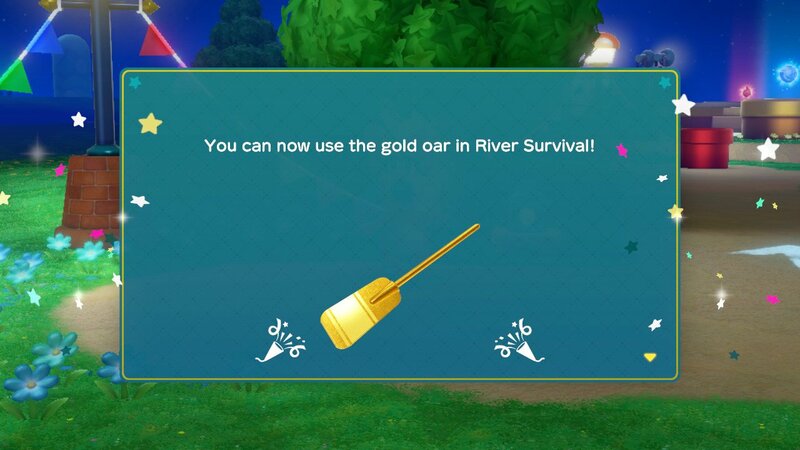 Spend enough time playing the River Survival mode in Super Mario Party and you will eventually have the chance to unlock the Gold Oar. Aside from Birdo being the character that will hand it to you, there doesn’t seem to be a clear method to unlock it. For me, I had collected the five Gems to be crowned the Super Star, returning to Party Plaza where, when speaking to Birdo, she had posed me with yet another question. With all four characters wielding a golden oar, it quickens your traversal down the river as well as replacing the pink balloons with golden ones – although the minigames remain the same. Super Mario Party is now available exclusively for Nintendo Switch worldwide. What happens when you choose “gold bar”? She just says “Do you think i’m made of money!?! Well come back to me if you want to ask me something else. Then when you talk to her she says the same thing and offers the same choices.